Established in 1977, the F. Gene Dixon Student Leadership Award recognizes outstanding students graduating from dental school. 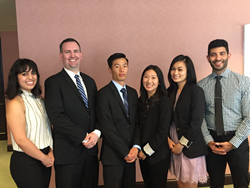 Delta Dental of California is recognizing six exemplary dental school students with the F. Gene Dixon Student Leadership Award and a grant for $20,000 each. The 2017 F. Gene Dixon Student Leadership Awards recognize graduating dental school students who demonstrate outstanding leadership abilities. The awards were established in 1977 in honor of the late Dr. F. Gene Dixon, the first chief executive officer of Delta Dental of California, which is now part of the largest dental benefits delivery system in the country. This year’s recipients are Christopher A. Chan of Loma Linda University, Michael Stout of University of the Pacific, Mona Nejad of UC San Francisco, Mishaun Sahebi of the University of Southern California, Diana Wang of UCLA and Bao-Tran Truong of Western University. Delta Dental of California, Delta Dental of New York, Inc., Delta Dental of Pennsylvania and Delta Dental Insurance Company, along with their affiliated companies, together provide dental benefits to nearly 35 million people in 15 states plus the District of Columbia and Puerto Rico. All are part of the Delta Dental Plans Association, whose member companies collectively cover 74 million people nationwide.